“That’s what it’s all about, doors and sardines. Getting the sardines on, getting the sardines off. That’s farce. That’s – that’s the theatre. That’s life,” explains the harried director, Lloyd Dallas, as the final tech rehearsal for his dismal farce, opening in the equally dismal Weston-Super-mare, runs on past midnight. 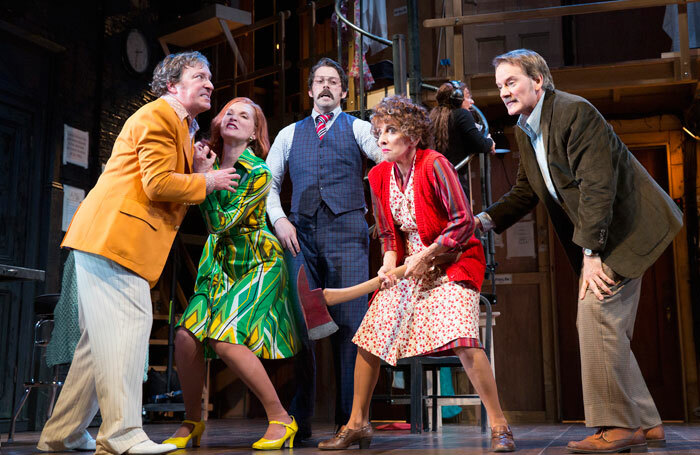 It’s also the stuff of Noises Off, Michael Frayn’s still-riotous 80s backstage comedy, now receiving its third Broadway outing in a new production by Jeremy Herrin. His production, while looking much like the revivals I’ve seen before, brings to it a new level of physical inventiveness and comic daring, as well as one or two touches of unabashed Broadway over-acting. It’s a play that I have long loved, and loved again here, the mugging and occasional dodgy English accent notwithstanding. Herrin’s production captures the precision engineering of the first and third acts and the carefully calibrated comic machinations of Frayn’s concept. It’s not Herrin’s fault that the second act, in which we view the action from backstage, feels looser and a bit more random. The actors bring the right degree of panic and desperation to the situations they find themselves in, with Rob McClure’s company and tech manager visibly vibrating in terror when he has to go on stage and make an appearance himself, while Tracee Chimo is a picture of both personal and professional anguish as ASM Poppy Norton-Taylor, with a revelation of her own to impart. The onstage cast of the farce also do strong work: David Furr falls down staircases in spectacular style, and Megan Hilty is hilarious in her portrait of a hopeless actress whose contact lenses have a life of their own. A tremendous Broadway revival of play that remains a laughter-generating machine.